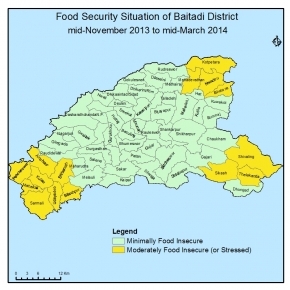 Although Baitadi district is minimally food insecured during this reporting period then also it was moderately food insecure during Jul.-Aug. months. Out of 62 VDCs and 1 Municipality of Baitadi district all 48 VDCs of cluster A and 15 VDCs of cluster B are minimal food insecure. Production of summer crops maize and paddy was normal which increased HHs food stock for more than four months whereas in cluster B most HHs food stock is sufficient for 3-4 months due to marginal cultivated land. Key markets have sufficient food stock due to frequent access of transportation. Market price of rice was increased by 6.25% compared to last year. This was good period for remittance inflow as people were in migrating for celebrating festivals_Dashain, tihar, harvesting summer crops and CA election. Wage employment opportunities were there as different development works were run by GOs, I/NGOs. People are using traditional livelihood strategies for living by doing wage labor, selling vegetables, honey etc. Water supply and sanitation systems were operational as no any obstruction due to extreme climate and availability of water was sufficient during this period. No any significant natural disaster and diseases has occured whereas security situation was generally peaceful. The overall situation is expected to detorate in next cycle as there will be no new crop harvetment and HHs will have to relay on limited food stock. Key markets will have sufficient food stock to meet the demand as roads will not be blocked. Market price of rice will be in increasing trend. The situation in Cluster A will remain similar as the summer crops production was normal and most HHs have balance food stock for more than 4 months. Moreover these VDCs are road head touched and there are good oppourtunities of wage employment.